There are a lot of reasons The Talons of Weng-Chiang is one of the best Doctor Who stories in the series’ history. Despite some cheesy yellow-face on a white actor and the even cheesier giant rat costumes, this combination of Fu Manchu, Phantom of the Opera, and The Time Machine creates a world all its own. In a unified dark atmosphere the six part serial introduces several of the series’ most memorable characters, each representing different aspects of this strange 1889 London. The only serial where the Fourth Doctor (Tom Baker) never wears a giant scarf, we see him instead casually emerging from the TARDIS in a deerstalker and Inverness cape. 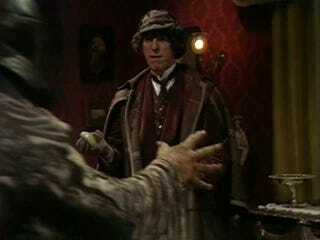 He never directly mentions Sherlock Holmes, the gag being the sort of dry visual joke Tom Baker excelled at. His powers of affable understatement are on good display when Leela (Louise Jameson) points out she’s saved his life by killing a thug who’d sneaked up behind him. “Well, in that case you’d better come along,” he says. He keeps this up when he meets the ebullient Mr. Jago (Christopher Benjamin), proprietor the music hall where the sinister Chang (John Bennett) performs a magic act. After the Doctor and Jago investigate a shadowy figure back stage, the former seems charmed by the latter’s nervous bluster and offers him a good meal, further charmed by how enthusiastically the offer is accepted. Christopher Benjamin plays a great Falstaff, by the way, I’ve seen him in a production of The Merry Wives of Windsor. But he still finds time to record Jago and Litefoot audio plays, a spin-off series from this particular Doctor Who serial. The other half of that duo, Litefoot (Trevor Baxter), is also introduced in The Talons of Weng-Chiang but under very different circumstances. A sensitive gentleman and a medical examiner for the police, he can scarcely believe it when he’s forced to agree with the Doctor’s assessment that a corpse’s wounds look like they came from the teeth of a giant rat. This is part of the reason the story works so well despite the rat costumes that look like they belong at Chuck E. Cheese—the story builds their menace in dialogue. Also helping in the menace department is Weng-Chiang himself (Michael Spice), aka Magnus Greel, whose story you can hear more of in the Fifth Doctor audio play The Butcher of Brisbane. The backstory rattled off quickly by the Doctor near the end of this serial is certainly fertile ground for expansion, having to do with the Doctor serving in a Filipino army against Greel who also has the strange and eerie Peking Homunculus or “Mr. Sin” (Deep Roy), an effectively eerie animated doll in Talons of Weng-Chiang. But not as eerie as Greel himself whose costume reminds me of the Klimt inspired robe Gary Oldman wears in Francis Ford Coppola’s Dracula. He also wears a nice broad brimmed Phantom of the Opera-ish black hat at the beginning and his leather mask is perfect. It all wouldn’t work half as well if the serial wasn’t so wonderfully dark. Apparently director David Maloney did an extraordinary amount of actual night shooting in this serial and I’m so glad he did. The dingy, treacherous alleyways of Victorian London pack so much more punch when they’re lost in 75% shadow. There’s so much effective horror in this serial that it enhances the comic relief provided by Jago and Litefoot considerably, the two always seeming duly terrified even as they are adorably ridiculous, never so sabotaging the reality of the scene à la Abbott and Costello. This isn’t a very strong serial for Leela despite the fact that she has several moments I like. Her fight choreography is a bit lacklustre and she spends a lot of time haplessly following people about but I like her line when the Doctor asks her if she knows what some futuristic crystal gadget is—”Oh. You ask me so that you can tell me.” I also like when she substitutes herself for a hypnotised prostitute to get the drop on Weng-Chiang. Her Eliza Doolittle schtick is adorable, too, especially when a flustered Litefoot politely joins her in eating meat off the bone. And after all this, the serial climaxes in one of the show’s best ever set pieces; a melee before a great golden dragon that shoots green lasers from its eyes. But there are almost too many things to list that make this a great serial.